This story was updated at 10:56 a.m. EDT. Halloween is nearly upon us, which means Earth will soon be crawling with costumed witches, ghouls and zombies. But October has shown us that our planet doesn't have a monopoly on spookiness. Over the last month, a series of cosmic phenomena have provided thrills and chills, just in time for Halloween. Here's a rundown of the recent spooky space news, from revelations about vampire stars to a plan to build Frankensatellites in orbit. 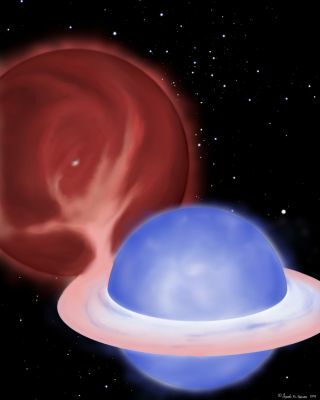 "Blue stragglers" are mysterious stars that act much younger than the ancient neighbors with which they formed. They burn much hotter, for example, and appear much bluer. Astronomers have been trying to explain the origins and behavior of blue stragglers since their discovery in the 1950s, and a new study may finally have done the job. It appears that most blue stragglers are vampires, sucking hydrogen fuel away from companion stars. The threat of death from above can inspire fear beyond reason, perhaps because we're often helpless to predict or combat it — just ask Chicken Little. And this October brought an event that evoked some "sky is falling" sentiment. On Oct. 22, a dead German satellite called ROSAT slammed into Earth's atmosphere over the Indian Ocean, apparently harming nobody. It was the second uncontrolled satellite crash in a month; NASA's defunct UARS spacecraft fell to Earth on Sept. 24, also causing no known injuries. Experts had said that there was just a 1-in-2,000 chance that any piece of ROSAT would strike anybody anywhere on Earth. But those odds, while small, were non-zero — enough to get a lot of people talking, and some of them worrying. Since Mary Shelley published her novel "Frankenstein" in 1818, the idea of creating new life from disparate dead parts has been a staple of the horror genre. And now the concept is getting some traction in space. The United States' Defense Advanced Research Projects Agency (DARPA) announced on Oct. 20 that it wants to harvest still-working parts of dead satellites, then incorporate them into new space systems on the cheap. In DARPA's plan, a servicing satellite would pluck functioning antennas from defunct spacecraft, then attach them to newly launched mini-satellites in orbit. The "Frankensats" would save the military on launch costs, because antennas are so big, bulky and expensive to get off the ground. Mary Shelley and her iconic novel also figure prominently in another recent celestial story. Shelley was reportedly inspired to write "Frankenstein" in the summer of 1816, after staying up all night swapping ghost stories with her future husband Percy Bysshe Shelley, Lord Byron and several other friends. At the end of the evening, Byron is said to have challenged each member of the group to come up with his or her own scary tale. Shelley later wrote that she couldn't come up with an idea for several days, but then had a terrifying nightmare about a scientist who created a monster from an assortment of body parts. Some authorities have questioned her version of events, suggesting Shelley may have taken some liberties with the truth for the sake of a good story. A new study, however, suggests that Shelley's account rings true. She mentioned that moonlight streamed into her room when she awoke from her dream in the middle of the night. After poring over astronomical records and visiting the Switzerland estate where Shelley and the group met, researchers determined that light from a bright gibbous moon probably did flood Shelley's room in the wee hours of June 16, 1816. Byron's ghost story challenge, the researchers conclude, likely took place between June 10 and June 13, and Shelley probably awoke from her nightmare around 3 a.m. on June 16. Full moons are another Halloween trope, bringing out the werewolves as they do (according to lore). And October's full moon was particulary noteworthy, for it was the smallest one of the year. October's full moon, which peaked on Oct. 11, coincided very closely with lunar apogee — the point in the moon's orbit each month when it is farthest from Earth. The moon reached apogee, which this month was a distance of 252,546 miles (406,434 kilometers), on the morning of Oct. 12. Winding your way through a corn maze, perhaps while sipping apple cider and scarfing down some kettle corn, has become an autumn tradition in many parts of the country. But it's a tradition that fills some with dread — those who read Stephen King's 1977 short story "Children of the Corn," for example, or saw one of the many films inspired by it. This fall, NASA teamed up with seven farms around the country to build corn mazes that celebrate the nation's space accomplishments. So far, there have been no reports of strange goings-on at any of the mazes; everyone who has gone in appears to have made it out. A giant rocket serves as the centerpiece for the Space Farm 7 corn maze at Belvedere Plantation in Fredericksburg, Va. The maze is one of seven corn mazes across the United States by farms participating in the Space Farm 7 project in 2011. Meteor showers may have been scary to ancient peoples, who perhaps thought they indicated that the sky was falling. But to us, they're just cool, and one of them, the Taurids, is getting set to put on a show. The Taurids are sometimes called the "Halloween fireballs" because they tend to blaze up between mid-October and mid-November. This year, the best time to view them are the early morning hours of Nov. 5. After the moon sets, around 2:40 a.m. local time, you may be able to see 10 to 15 meteors per hour. Look toward the constellation Taurus (the Bull), which should be nearly directly overhead at this time. The meteors will seem to emanate from Taurus, which explains the shower's name.